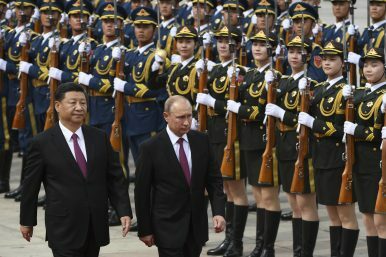 Russia's President Vladimir Putin, center, reviews a military honor guard with Chinese President Xi Jinping during a welcoming ceremony outside the Great Hall of the People in Beijing Friday, June 8, 2018. Would the US Really Lose a War With China and Russia? A new study offers little evidence for its bold generalizations that the U.S. is losing its ability to win a state-vs-state war. The reason for this seems simple: The United States is purportedly losing the ability to defend its allies and partners, as well as its own vital interests, as a result of a weakened military. (Notably, the study endorses the findings of the 2018 Nuclear Posture Review.) Consequently, the report pushes for an increase in defense spending, the acquisition of additional military capabilities in key areas, and a general boost of the readiness of U.S. forces in order to meet the aggression of authoritarian competitors China and Russia; the rogue states of Iran and North Korea; and transnational threat organizations including radical jihadist groups. The report suggests that the United States stay the course, indeed double down, on its global defense commitments, rebuild its military strength, and more assertively confront its adversaries. In short, the authors of the study once more sing the Groundhog Day paean of the bipartisan U.S. defense establishment. While the study diagnoses a new reality of major power competition and conflict, its prescription to resolve the alleged national security crisis is blatantly generic and, once stripped of the usual idioms found in such reports (e.g., credibility, whole-of-government, holistic strategies, etc.) can be summed up in two words: more money. Unfortunately, the report fails to make a good case for the very existence of this presumed national defense and security crisis. Nor does it in any way help “make hard choices” when it comes to defense spending as the basic premise underlying the analysis of the U.S. armed forces beyond a “the bigger, the better” approach. Additionally, the two major causes for this crisis, as outlined in the study, the 2011 Budget Control Act (BCA) and a failure to enact timely appropriations, as well as the manifold threats posed by the four countries cited above and transnational threat organizations, are insufficiently analyzed. Leaving aside a deeper discussion of the BCA and appropriations, it suffices to say that if a $670 billion defense budget is inadequate to “fulfill the strategy’s [2018 National Defense Strategy] end,” as the authors suggest, perhaps it is time to reevaluate the strategy. I’d like to briefly focus on China and Russia — the presumed biggest threats to U.S. national security. If the United States had to fight Russia in a Baltic contingency or China in a war over Taiwan (…) Americans could face a decisive military defeat. These two nations possess precision-strike capabilities, integrated air defenses, cruise and ballistic missiles, advanced cyberwarfare and anti-satellite capabilities, significant air and naval forces, and nuclear weapons — a suite of advanced capabilities heretofore possessed only by the United States. The U.S. military would face daunting challenges in establishing air superiority or sea control and retaking territory lost early in a conflict. Against an enemy equipped with advanced anti-access/area denial capabilities, attrition of U.S. capital assets — ships, planes, tanks — could be enormous. The prolonged, deliberate buildup of overwhelming force in theater that has traditionally been the hallmark of American expeditionary warfare would be vastly more difficult and costly, if it were possible at all. Put bluntly, the U.S. military could lose the next state-versus-state war it fights. The two criteria for predicting American defeat indicated above are based on the U.S. losing air superiority on the one hand and the difficulty of assembling its forces in theater on the other. Again, there is no evidence why this would be the case in the event of a conflict given prevailing U.S. military superiority in the air and in logistics. Even if that were the case, such difficulties would likely be temporary and not constitute a devastating setback. Indeed, there also appears to be confusion over what a decisive military defeat entails: the destruction of U.S. military forces in the region, or just temporary setbacks, including the loss of air superiority and mass casualties. Remarkably also the report does not include even a superficial treatment of Chinese and Russian defense budgets and military capabilities, save some generalities. Indeed, one is left with the false impression that U.S. military has already lost its technological edge over both adversaries. In sum, the study reveals a distinctly American mindset, influenced by the unipolar moment of the 1990s and the insurgency wars of the 2000s, where the United States was able to fight relatively bloodless campaigns against technological inferior opponents. The rest of the world, meanwhile, given U.S. military superiority, always had to plan military campaigns with the assumption that a military conflict would be fought against a technological superior enemy and cause mass casualties. In that sense the study is a prime example of what I once called the “U.S. War Gap” paradox. In the cited paragraph the authors utterly fail to connect their facts to the report’s threat inflated conclusions. Lastly, the report also does not offer an analysis why conventional deterrence in the case of China and Russia would not hold and what precisely their strategic rationale for seizing the Baltics and closing the South China Sea to international shipping traffic (for example) would entail. As John Mearsheimer wrote in the 1980s, if one side thinks it has the capacity to launch a Blitzkrieg-style military operation and achieve a quick military victory without having to fear massive retaliation, conventional deterrence is likely to fail. Yet, there is virtually no indication in Chinese or Russian strategic thinking that would suggest that policymakers in either country think their militaries would be able to achieve a quick military victory over the United States. As such it unclear how the two countries could trigger a national tragedy of “unforeseeable” and “tremendous magnitude” unless the conflict turns nuclear, in which case, winning or losing would become abstract terms devoid of meaning. India-US-China: Aligning Interests or Managing Threats?Is This What the Pentagon's 'Third Offset' Has Been Missing All Along?Fear and Honor: The Other Side of US-China 'Thucydides Trap'How America and China Have Different Visions of International OrderCan China Tap Private Sector Innovation in Defense?